By Jordan Kelly Bingham, of Victoria Abbott's book collector mysteries. I am very excited to be part of a Sisters-in-Crime blog hop. My author has asked me to thank Leslie Budewitz for tagging her. I’m not entirely sure what a blog hop is, but it sounds like great exercise and I love that name: Sisters-in-Crime. As I’m the first person in my family to go straight, I’m sure you can see where it would resonate with me. I don’t have any sisters though, only uncles. Still, it’s great to know this organization is out there advancing the interests of women mystery authors. I’ve been asked which authors have inspired me. I live for questions like this. A little background will explain that. I need money to get back to grad school (long story) so I work for Vera Van Alst. Some of you may know that she’s the most hated woman in Harrison Falls, N.Y., but that is neither here nor there. Vera is one of the foremost collectors of fine first editions from the Golden Age of Detection. I am her assistant. Naturally, I have been inspired by the great authors of this golden age. Agatha Christie, Dorothy L. Sayers and Rex Stout, among others. Because things went wrong (pear-shaped as they say in Britain) while we were working on these collections, I barely escaped with my life from The Christie Curse, The Sayers Swindle and The Wolfe Widow. That last one was just released this month. I’m still getting my heart rate under control. These are wonderful writers. Today I can pick up any one of their books and be caught up in the story. I am rereading many of them. They are still witty and gripping and cleverly plotted. What a legacy these authors leave us. Books on my nightstand right now? I’m so glad you asked that. I’m working my way through the novels of the great Ngaio Marsh, all thirty-two of them. Vera is only interested in fine firsts, but I love mass market reprints. A friend, Nancy Reid, made me (well, my author, but never mind) a gift of twenty-nine of them (see above) How cool is that? They’re keeping me up nights. Apparently, I’ll be showing up soon in The Marsh Madness. I understand there will be peril. Thinking of the Golden Age of Mystery has made me wonder. Are we in a new Golden Age? There are so many clever, fast-paced, well-plotted books with wonderful, sympathetic characters, that we are blessed. So much to read. There's a great crop of mysteries this fall. I appreciate the thirty-one series you find on Killer Characters. I have made friends with many characters here. It appears I’m not the only one with an interesting life and a few troubles. I just finished Nightmares Can Be Murder by Mary Kennedy and loved it. There are so many great books and authors. I’m very excited about new mysteries coming next week from Daryl Wood Gerber's Stirring the Plot, Sheila Connolly’s Picked to Die and Barbara Fradkin’s None So Blind to name just a few. But before we go, it's my turn to tag the next Sister in Crime in this blog hop. I’m choosing Lizzie Turner from the Ashton Corners mysteries by Erika Chase because I just finished her latest mystery Book Fair and Foul and I love mysteries about books. This one didn’t disappoint. Lizzie and maybe some of her friends will be here on Killer Characters on October 7! October is the new September. You heard it here first. 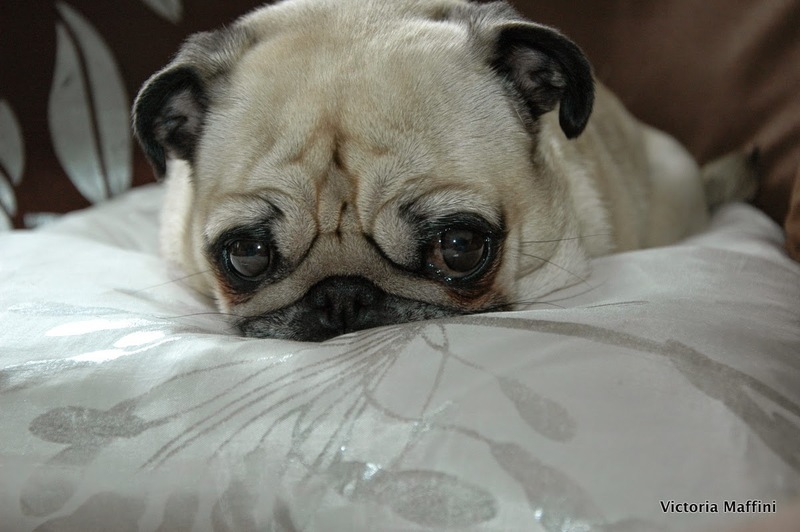 The blog hop included no questions about cute pugs in books. Sorry Walter. You’ll just have to cope. Thanks for coming by, everyone. So glad to be joined in a love of mysteries! That shadowy figure known as Victoria Abbott is a collaboration between the always very funny and creative artist, photographer and short story author, Victoria Maffini and her mother, Mary Jane Maffini, award-winning author of three mystery series and two dozen short stories. Their book collector series combines contemporary sleuthing with novels from the Golden Age of Detection. The Christie Curse links to the great Agatha Christie, and the second, The Sayers Swindle, draws on the work of Dorothy L. Sayers. 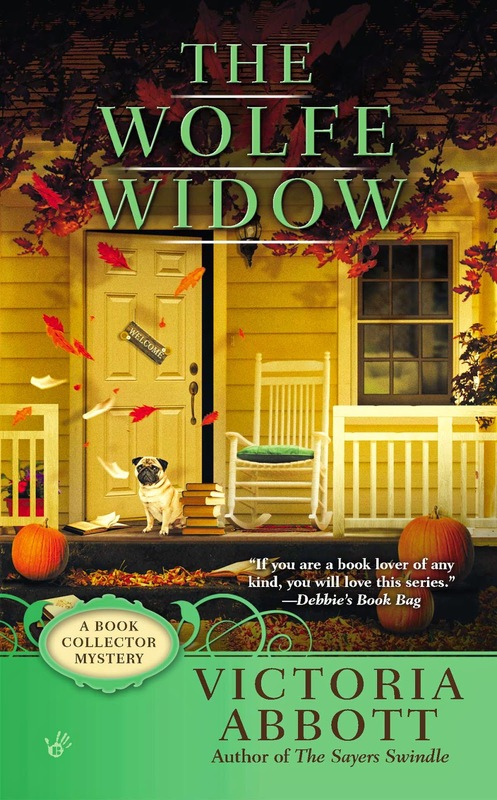 Because ‘some people’ have a crush on Archie Goodwin from the Rex Stout books, The Wolfe Widow hit the shelves September 2014. And they haven’t killed each other yet. Thanks for the kind mention Victoria / MJ. I love the idea of gaining an extra month (the new September) to catch up reading new releases. Thank you, Nancy! I'll pass your comment on to Jordan. Thanks, Lorraine. I am so happy. Please come to dinner some time at Van Alst House.